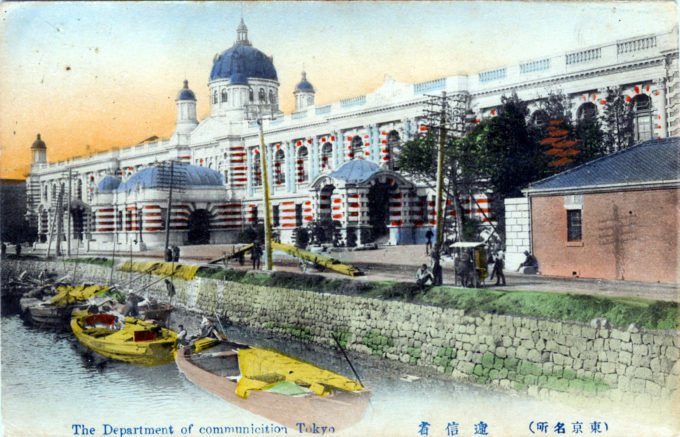 “The Department of Communication”, Tokyo, c. 1910. Construction was completed in May 1910. Although Satachi Shichijiro did not have the same illustrious career as a classmate, the architect of the new Ministry of Communications building was in the same 1879 graduating class of the Imperial College of Technology alongside another famous Tokyo architect, Tatsuno Kingo. From the wiki: “On December 22, 1885 the Ministry of Communications was established, combining the Bureau of Posts and Post Station Maintenance and Shipping Bureau formerly under the Ministry of Agriculture and Commerce with the Telegraph Bureau and Lighthouse Management Bureau formerly under the Ministry of Industry.